Crossing False Creek a quarter mile east of the Burrard Street Bridge is the Granville Street Bridge. It was opened in 1954 and was the third bridge at this location. To make up for the deficiencies in capacity of the Burrard Street Bridge, this bridge was built (by the City of Vancouver) with eight traffic lanes at a cost of $16.5 million. 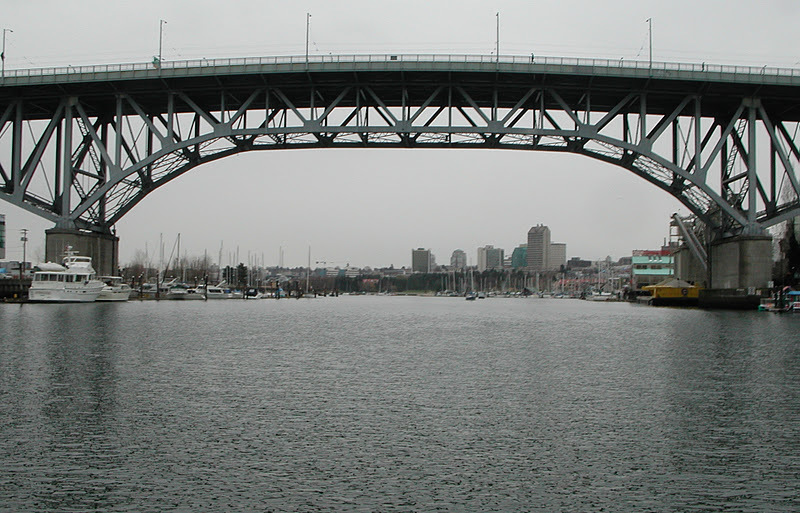 Granville Street Bridge is a cantilever deck truss with long approaches at both ends that carry Highway 99 over city streets and Granville Island. The bridge provides 27.4 m (90 ft) of vertical clearance over False Creek. It carries vehicles, cyclists, and pedestrians. The cantilever truss is supported on large concrete caissons while the approaches are supported on two column concrete piers. Vancouver's Bridges: Granville Street Bridge by Mark Yashinsky is licensed under a Creative Commons Attribution-NonCommercial-ShareAlike 3.0 United States License.